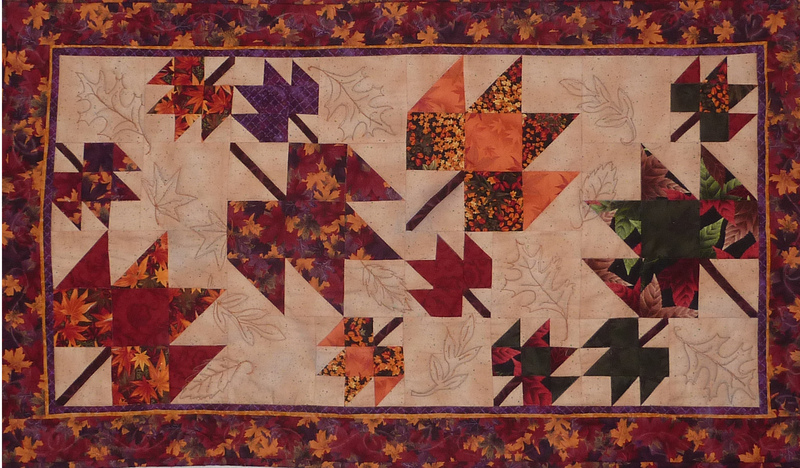 Grace your Thanksgiving table with this beautiful Tumbling Leaves quilt – shown in a versatile size ready to decorate your wall or your table throughout the season. Give the shop a call tomorrow to sign up: 805 – 581-1577. 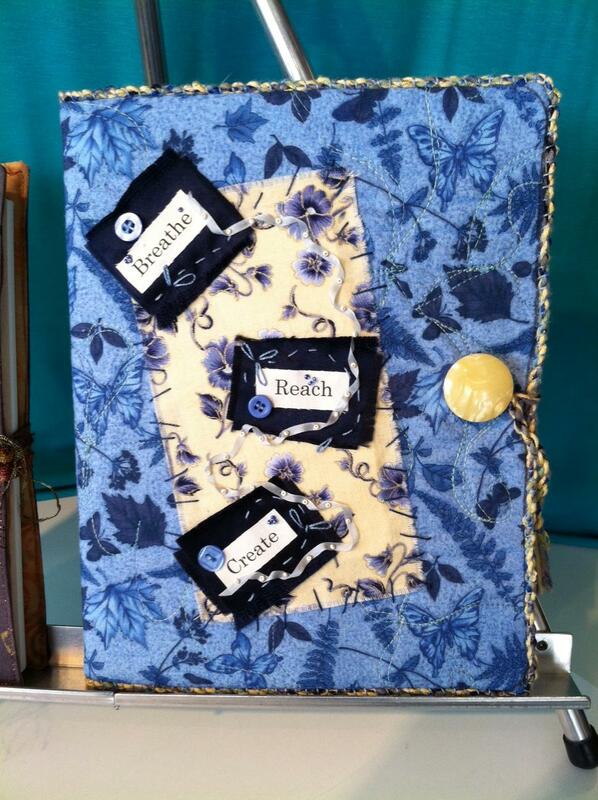 For confident beginning quilters and above. No borders and no picky seams to match! (c) Guila Greer – original pattern – all rights reserved; please do not reproduce. Thank you. Quilt Clinics – For UFOs and MORE !!!!! You’ve heard of Baseball or other Sports Clinics??? 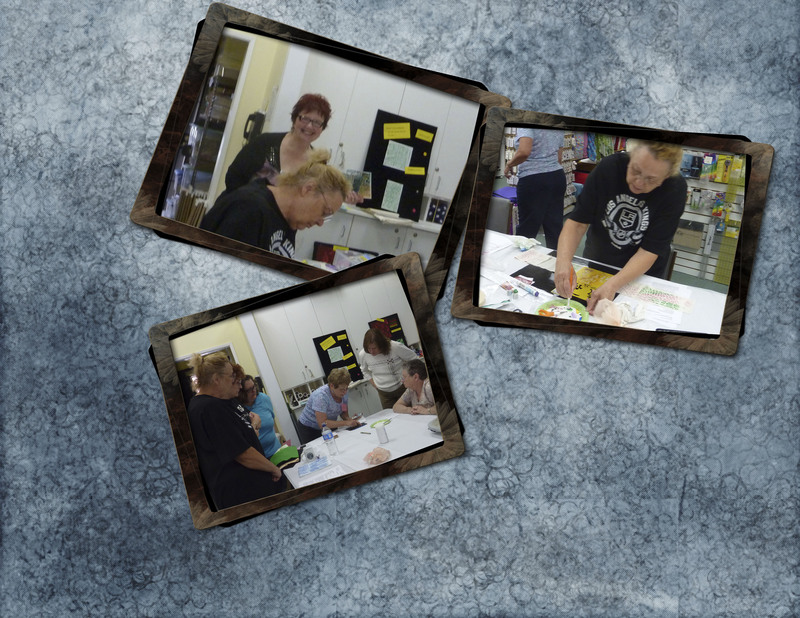 You will have the expertise of 2 seasoned quilt teachers on hand to help you finish some of those projects that need additional assistance. Call the shop and reserve your spot and let’s get those project’s done!! 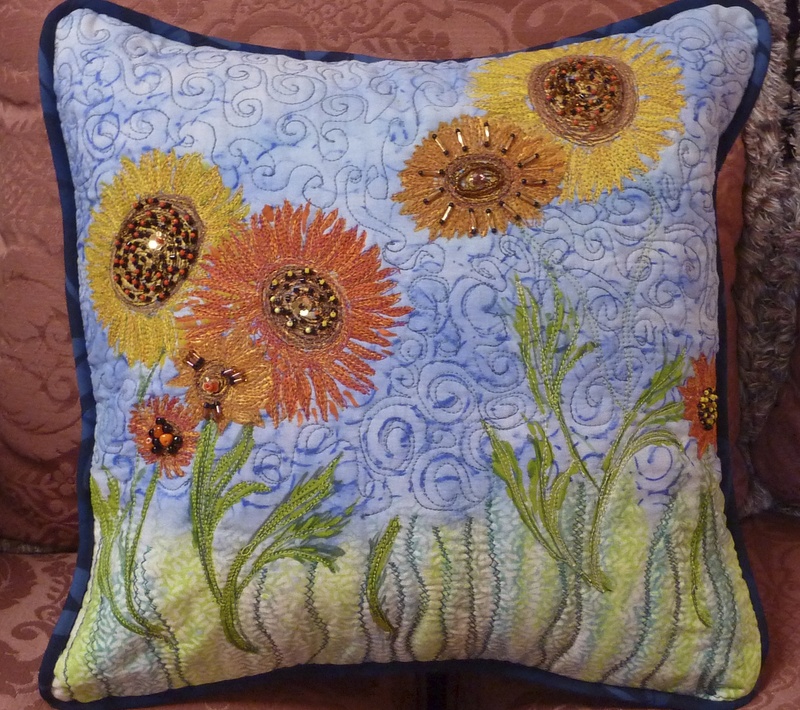 Sign up for this class at Quilty Pleasures – Simi Valley – It is sceduled for Saturday November 2 from 10 AM until 4 PM. You will make a beautiful piece of Home Decor to use as a table or mantel runner. 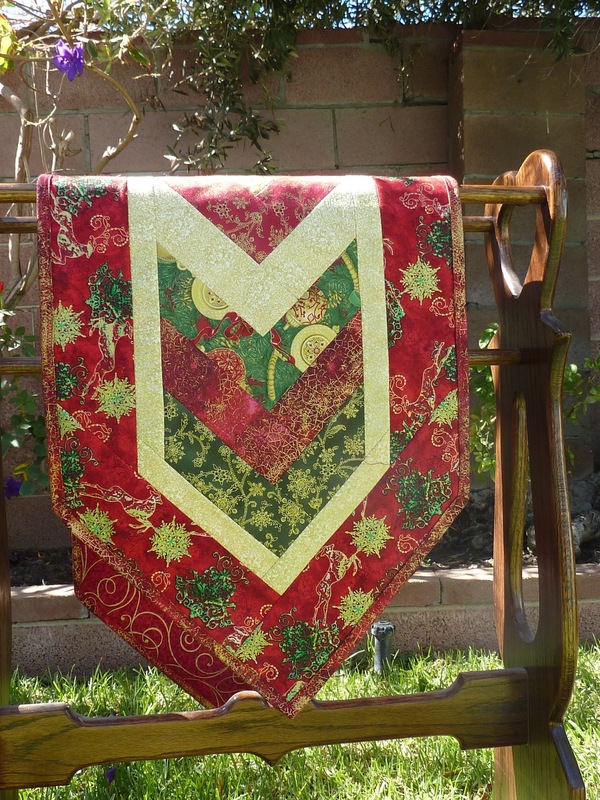 It is shown here in festive holiday colors but can be made in the fabric of your choice. 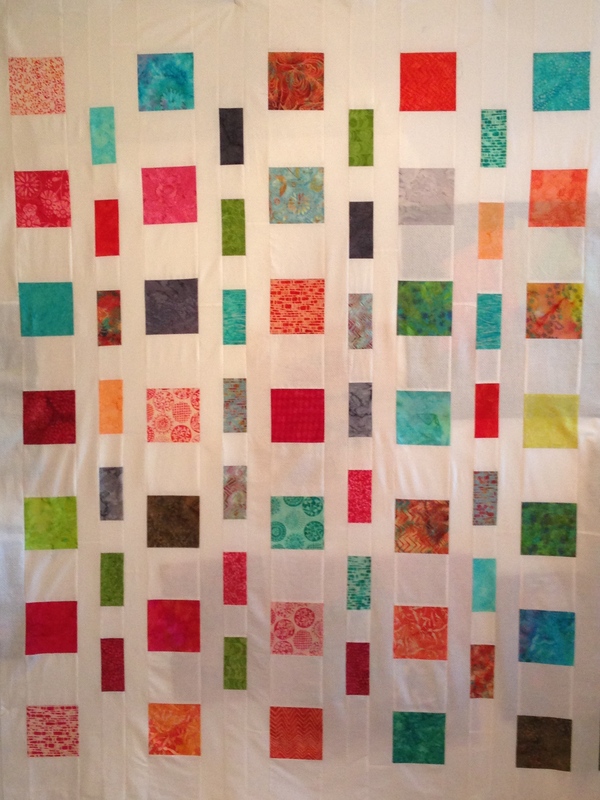 “Quilt As You Go” so that when you have finished adding the last border you are finished! Quilting has already been done. This is going to be a fun class so go ahead and call the shop today to reserve your spot. The more I make these samples the more ideas I get for using them. Right now I’m working on a cute cover for a collection of recipes. Also in the works is a cover that’s perfect for a knitting or crochet diary. Keep records of what you made – type of yarn – needles used, and so on. Here are a couple more that are suitable for just about any topic. One of the benefits of these particular covers is that when your composition book is full you can slip it out and replace it with a brand new one. 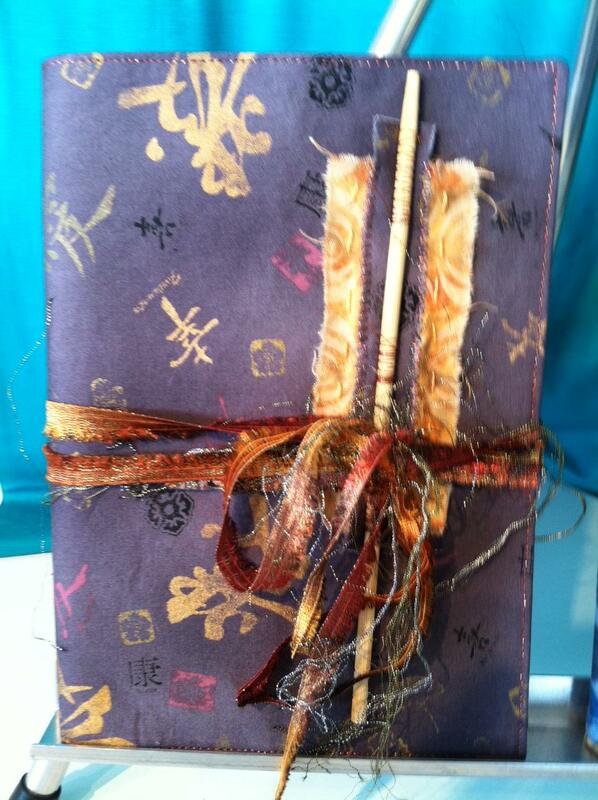 The cover shown above was made by Betsy Farwell and features a collage of nettiing with colorful ribbons and an unique toggle closure. I made this cover from a colorful batik and embellished it with a collage of cheesecloth, lace, silk pod, and decorative hand and machine stitching. 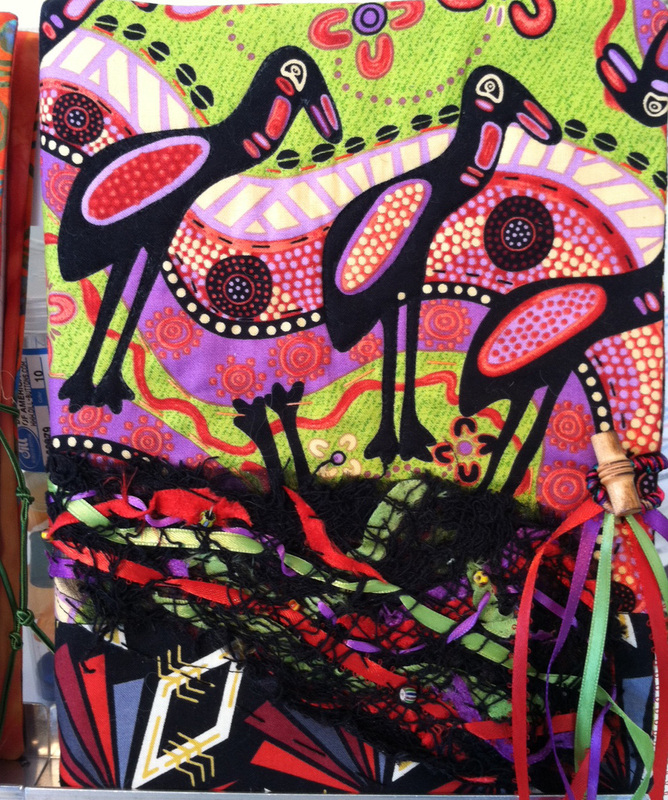 Call Baron’s in Woodland Hills for details about the Journal Cover Workshop scheduled for March 19 from 6 until 9 PM at Baron’s Sewing Center in Woodland Hills. Call 818-224-2746. 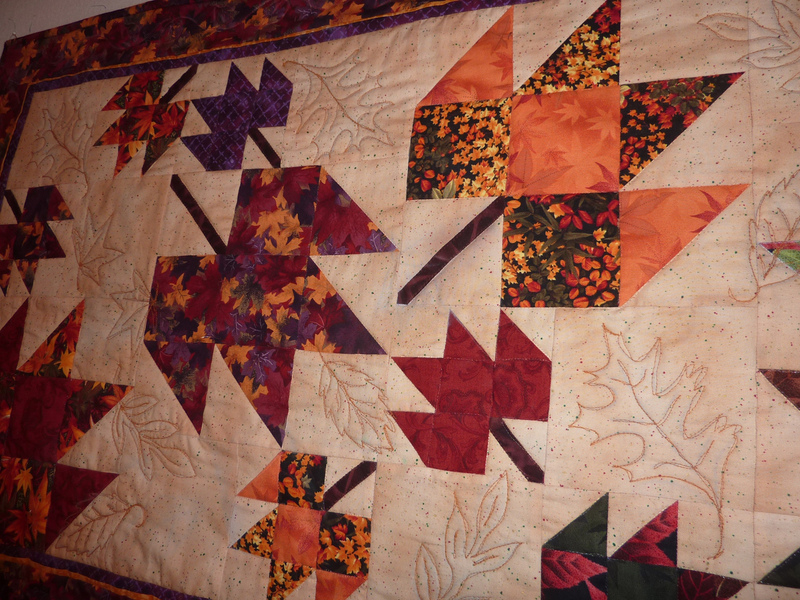 Topics in Art Quilting Techniques will continue into the New Year. For those who missed them the first time around we are repeating key topics such as Painting on Fabric, Putting on the Glitz and so on. 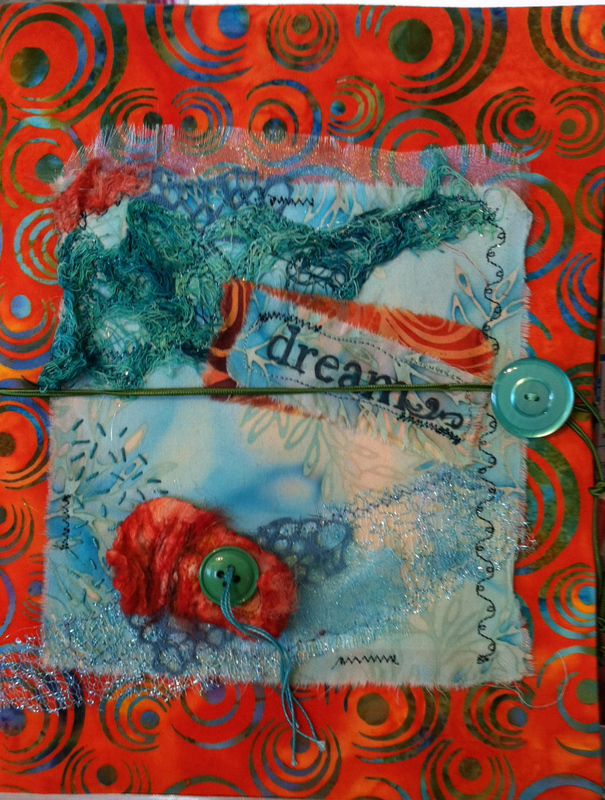 For those of you who are eager to delve further into Art Quilting Techniques we will be scheduling additional classes such as Using Alternative Materials in Your Art Quilts, Orphan Blocks as an Inspiration for Art Quilting and more! I CAN tell you that the first scheduled workshop of 2013 will be Tuesday January 15 from 6 PM until 9 PM. It will be Painting on Fabric. You will learn how to select and prepare your fabric; how to select appropriate paint for your project and how to apply the paint. You will learn techniques for stenciling and stamping with paint as well as how to apply paint with a brush to achieve the effect you are looking for. Make sure you wear clothes that won’t suffer if they receive some paint splashes or bring a coverup. It’s going to be a fun and creative evening. I expect to have the rest of the dates for the first quarter firmed up later this week so keep your eye on this space. And enjoy your Thanksgiving Day with lots of good food and surrounded by family and friends!